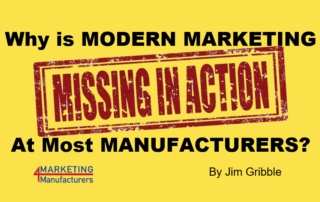 Why is Modern Marketing M.I.A. 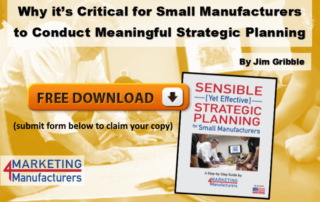 at Most Small Manufacturers? 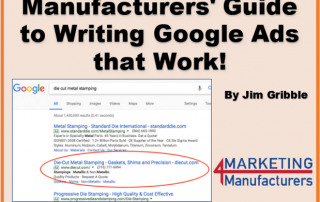 Manufacturers’ Guide to Writing Google Ads that Work! 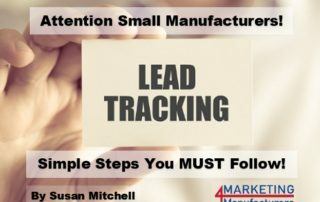 Tracking leads will help you understand better the kinds of companies, titles of individuals, and other criteria of those who are interested in your products and services which can help you find and generate more leads like them. ...when our discussion moved to online advertising, it was clear this struck a nerve with Steve. "AdWords is a total rip-off!" were his words, if I recall correctly. We're located in beautiful Northern Michigan and serve small manufacturers nationwide. 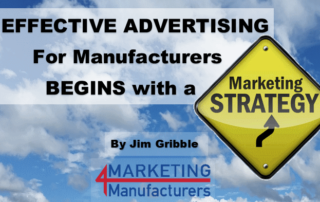 Marketing 4 Manufacturers provides U.S. manufacturers with custom marketing strategies, solutions, and management services aimed at their specific needs and opportunities.